The Artist’s Way at Work came out around six years after the success of The Artist’s Way: A Spiritual Path to Higher Creativity by Julia Cameron. If you haven’t heard of The Artist’s Way, take a look at Jessica Jones’ journey with the 12-week course. This version of the book was given to me by a coworker who had taken the course years ago. She found it helped her stay focused on her personal goals despite the everyday stresses of the workplace. I’d heard of The Artist’s Way for the past few of years and have been intrigued by it, but only recently have I gotten hold of the book. My work with the course started back in March after I’d decided to save money and make plans to leave my communications job to change my career to graphic design. I didn’t have a copy of the original The Artist’s Way, so I’d hoped this would be similar. However, a few weeks into the course, Jessica Jones and I compared notes and we both realized that the books differed largely in some ways. For instance, The Artist’s Way is a spiritual guide compared to the more accessible Artist’s Way at Work, which is geared toward the office employee or corporate career type — those who don’t usually or readily identify themselves as artists. This version of the book helps the reader to identify and face difficult issues that arise in the workplace in hopes to resolve them peacefully and with understanding — all while being true to her inner needs and making time for personal and spiritual development. And while I had already made my decision to transition away from the office, this book was just as good as any guide, so I moved forward with the course. I took what I could from it and spun it for my own personal journey to break away from the exhausted, low-energy person I had become and get back to the driven, creative person I used to be. But the course gave me so much more than that. The goal is progress, not perfection, and what we want is to become fully aware, in every moment, of just the possibility of doing better. The book contains a number of allegories about certain business types battling outside forces that affect them on a personal level. It is very much like The Artist’s Way in that it forces you to face your demons and challenges you to put yourself out into the world, all while reflecting on your thoughts and reactions to these new environments. The course also helps you think deeper about your feelings about your work and colleagues. In addition to weekly assignments, you’re required to do morning pages and time-outs (artist’s dates). Morning pages are three pages written longhand of your goals, dreams, and intentions for the day and beyond. Time-outs are weekly dates you take yourself on that are related to your interests: go to a museum or play, check out a cool local event, or do something new and adventurous — alone. Self-reflection is a huge part of the course, and these two recurring activities are key. In my journey with the book, one thing I was super consistent with were my morning pages. Every morning I’d try to wake up a little earlier to write them, and I made a little ritual out of it: I lit a candle, ignited some incense, and sat at my desk or in the garden with some coffee and wrote. The more plans I made for myself, or the more epiphanies I had, the more synchronicity I started to notice around me*. You’re not supposed to read back what you wrote until the very end of the course, and as I went back and analyzed my thought patterns over the 12 weeks, I learned a lot about myself. We can all be hard on ourselves sometimes, and what I appreciated most about the course was its encouragement of self-coaching and self-love. The book also allowed me to lay the foundation for positive habits: Spending time by myself to reflect, being present in the moment, and making time for things that are important to me and that enrich my life. I started drawing and painting more, trying new things, and spending time with people who enjoy the same things. I even started running again. As I prepare for the next adventure in my life, I’m equipped with a steadier head on my shoulders, the ability to check myself if any negative thought patterns occur, and a readiness to exercise empathy and understanding in times of frustration. I’m more open to putting myself and my work out into the world, and experiencing the new and unfamiliar. You can say I’m on the path to an awesomer me. 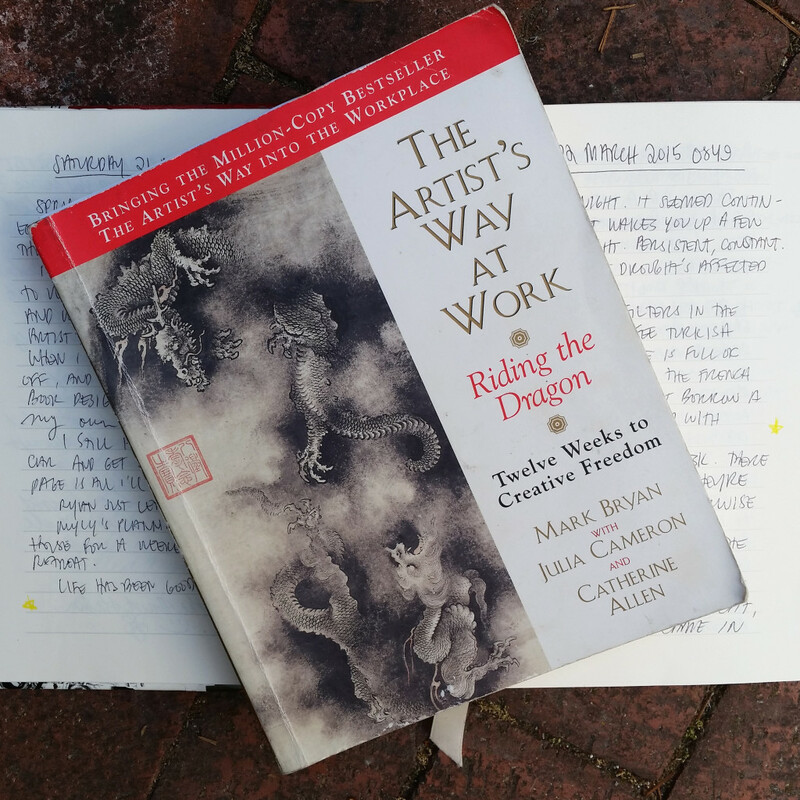 If you’re a creative with a full-time job and want to get back that special spark, I recommend reading The Artist’s Way at Work and doing the assignments to guide you through your creative emergence. Taking the course is a 12-week commitment just like The Artist’s Way, and everyone’s experience will be their own unique undergoing. You will definitely get out of it what you put in, so I recommend being open, consistent, and striving to be an awesomer you! * Talk about synchronicity: A couple of weeks into the course, I went to a café on a whim to work on my novel when a girl sat down at a table nearby with The Artist’s Way in front of her. “Excuse me,” I said, “I noticed you’re reading The Artist’s Way,” and then I pulled out my copy from my backpack, and we exchanged surprised laughter. Turns out she led an Artist’s Way meetup at that very café every Thursday. Needless to say I joined the meetup right then and there and discussed the book with kindred spirits. I’d wandered onto a serendipitous spot on the map of my new quest. That’s when I knew this was the right direction for me. Have you read this version of The Artist’s Way course? Has it helped you overcome obstacles in the workplace or aided you in your personal growth? Tell us about it in the comments below!